Summary: Like his name, Gray is dark and stormy. Dylan, a girl always searching for what’s next, seemingly unable to settle down, is the exact opposite: full of light and life. On the outside, they seem like an unlikely couple. But looks can be deceiving and besides, opposites attract. First Comes Love is releasing and passionate. Somehow, through Dylan and Gray, I was liberated from my own problems. The passion in this story is boiling over the top. It's not simply the romance either. The entire journey as individuals and a couple warmed my insides. Her writing flows like an endless sand-glass. From the inside to the out, First Comes Love is an accurate description of the journey of love. I pictured Dylan and Gray exactly like the models on the cover. Dylan is tiny, frail, especially in her plain white tank top. Gray is a more serious, shown by the shadows that cover him. Yet, he initiates the kiss. My only concern for First Comes Love is that some of the writing is passive. I didn't think the telling versus showing was a major factor. Kacvinsky often wrote "Gray tells me Hi," instead of "Hi," Gray says. Sure, I wasn't "inside" the story but, it was refreshing watching from the sidelines. A unique characteristics of FCL, First Comes Love, is the duel perspective. Dylan is eccentric, optimistic, and always in the clouds. She takes photos of geckos for crying out loud. Above all, Dyl's extremely caring. A characteristic I've tried to emulate in my life but, sometimes fall short . My favorite aspect of Dylan is her random spurts of wisdom. For example, "She tells me life is a story. We can make it a Harlequin romance, a mystery, a memoir. We can make it pamphlet-size or an ongoing series." Wow. A fictional character is giving me more knowledge than my daily devotional. The opposite of her fairy tale persona is Gray. 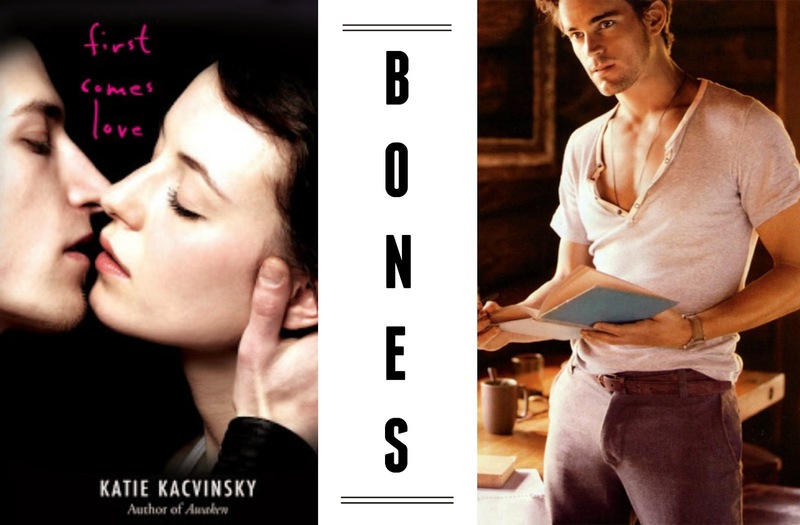 Tiny Bones tidbit- I LOVE THE NAME GRAY. Anyway, Gray reminds me a lot of my best friend. Gray closes himself off when dealing with pain. Dylan describes him as a folding chair, closed up and waiting to be shoved in a storage closet. He listens to music to instantly escape.Yet, he has the potential to be fun, hilarious, and carefree. In his opinion, Marvin Gaye's Sexual Healing is a great healing method. I enjoyed their love story. More importantly, the journey is what kept me reading. The novel is broken into 26 Relationship First. Examples are first meet, first unfold, first time, and first forget. The tale is real. I can promise you're not reading 224 pages of fluff. Musical Interpretation of First Comes Love. I love a novel that challenges me to question what I know about life. I'm personally giving FCL a Matt Bomer. Five stars for a novel that once started as a simple writing exercise for Miss Kacvinsky. Maybe one of my million writing exercises will turn into a stellar novel one day. Until next time. I NEED this book now! I've seen it around but I don't think I've read many reviews of it.